Whale of a Back Bone! Left to right: New vertebra with juvenile gray whale skull and bones in background. Profile view of vertebra atop a table in the PTMSC Natural History Exhibit (photos by M. Vane). A whale vertebra measuring approximately 3-feet tall and 4-feet wide arrived at the Port Townsend Marine Science Center last week. A couple found the bone while beachcombing in Southeast Alaska back in the 60’s. The unusual collectible was donated to PTMSC by their children all these years later with the intent to help the PTMSC inspire and inform others about whales. October 21 marked the 45th anniversary of the enactment of the Marine Mammal Protection Act (MMPA). This act recognizes that some marine mammal species have been negatively impacted by human activities. By outlawing the take* of certain marine mammals, the MMPA strives to ensure these creatures can continue to fulfill their integral role in the marine ecosystem. Come visit PTMSC's Grunt Sculpins! Yes, they really do scoot around on their fins! 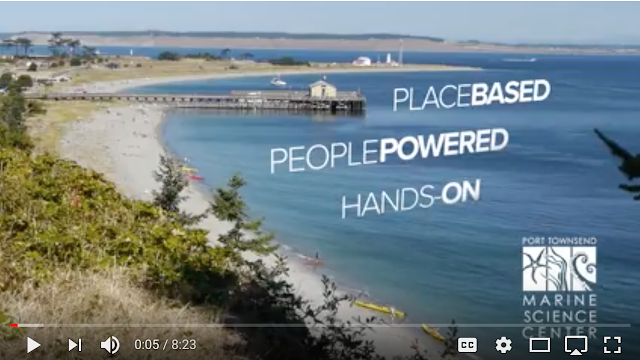 Volunteering at the Port Townsend Marine Science Center is a great way to get involved in your community, meet new people, and learn new skills. You don’t need a science background; just enthusiasm, passion, and a willingness to try new things. Questions or to RSVP, contact Gabriele at volunteer@ptmsc.org. Celebrating 35 years of #PTMSC inspiring conservation of the #SalishSea! The Port Townsend Marine Science Center is pleased to announce that retired NASA astronaut John Fabian is the recipient of the 2017 Eleanor Stopps Environmental Leadership Award. Fabian received the award at the annual PTMSC Stewardship Breakfast at The Commons at Fort Worden on Oct. 4. 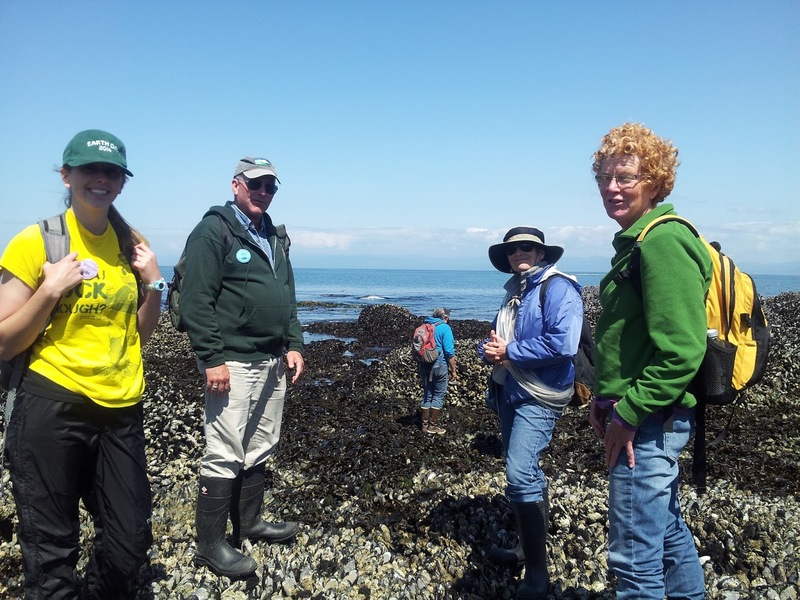 The prestigious award recognizes significant contributions in the protection and stewardship of the natural environment of the North Olympic Peninsula. 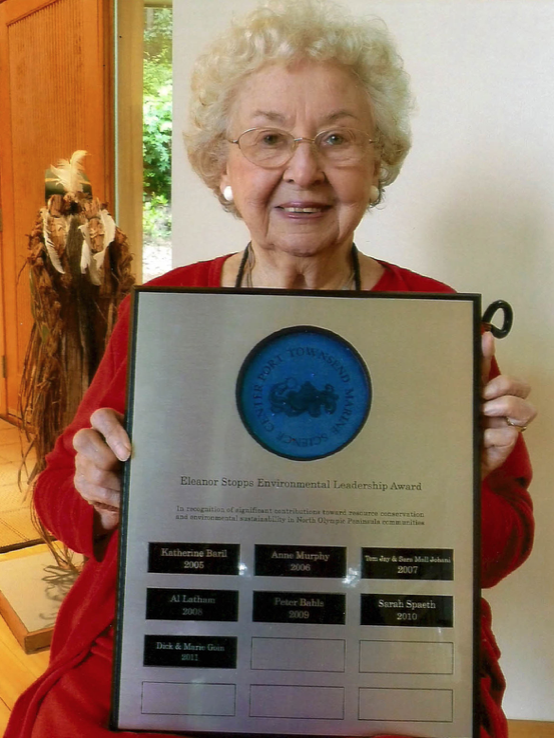 The award, now in its 13th year, pays tribute to Eleanor Stopps whose vision, advocacy and determination exemplify the power and importance of citizen leadership. "Through his pioneering work with the Hood Canal Coalition, Dr. John Fabian has led a determined effort to preserve the pristine ecosystem that is inextricably linked to the health of the Salish Sea," said PTMSC Executive Director Janine Boire. "Like Eleanor, he is a powerful coalition builder," said Boire. 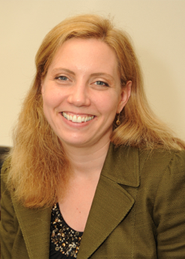 "It is so fitting that Dr. Fabian is this year's Eleanor Stopps Environmental Leadership Award winner. We are very pleased to recognize his leadership and grassroots advocacy today." 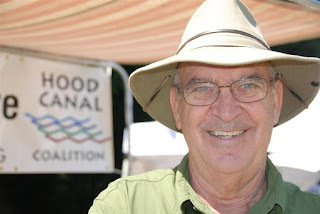 Upon receiving the award, Fabian said: "I am indeed honored to accept the Eleanor Stopps Award on behalf of the Hood Canal Coalition and its 6,000 members. Environmental stewardship encourages us to react responsibly to projects and policies that threaten our region." One of the few people to view the Earth from space, Fabian said most who have had that privilege share his concerns about the vast impact of human activity on the global environment. "I don't know anybody who's done it and hasn't come back more environmentally aware," Fabian told a Seattle Post-Intelligencer reporter in 2004. Fabian received his Ph.D. in Aeronautics & Astronautics from the University of Washington in 1974. 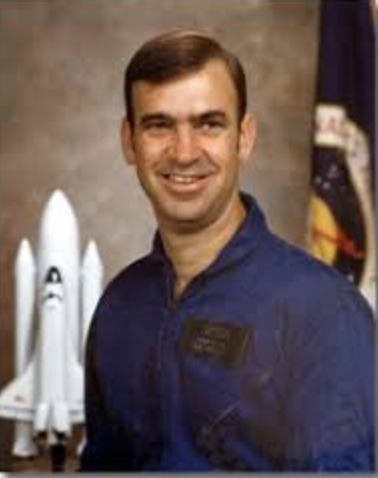 In addition to his national service with NASA, Fabian also distinguished himself as an Air Force pilot, served the Pentagon as Director of Space, and spent a decade leading a think tank that studied space systems. In 2004, while retired and living in Port Ludlow, Wash., an announcement from Fred Hill Materials --a nearby Olympic Peninsula gravel mining company -- caught Fabian's attention. The company was planning to send strip-mined gravel on a 4-mile conveyor belt through the unspoiled woods that would end at a 1000-foot industrial pier on the shores of the bucolic Hood Canal. Fabian sprang into action, writing letters, speaking at meetings and eventually co-founding the Hood Canal Coalition to fight the proposal. The coalition has grown to 6,000 members and, despite the odds against them, Fabian and his followers have, thus far, succeeded. In 2012, Fred Hill Materials closed and the company that took over -- Hood Canal Sand and Gravel -- lost a suit in 2016 that challenged a conservation easement. The ruling effectively blocks the company's plans. "I think the existing plan is dead," Fabian told the Port Townsend Leader in September 2016. "Whether they have an alternative plan, I don't know. We'll have to wait and see." From the 1960s through the 1990s, Eleanor Stopps was an active member of the Pacific Northwest conservation community. She founded the Admiralty Audubon Chapter and was a primary driver behind the establishment of the Protection Island National Wildlife Refuge in 1982, one of the few federally protected marine refuges established by an Act of Congress at that time. Today it is a critical habitat link in the preservation of the entire Salish Sea region, providing breeding grounds for Pigeon Guillemots and Rhinoceros Auklets, Bald Eagles and Peregrine Falcons, Harbor Seals and Elephant Seals, and myriad other species. Stopps died in April 2012 at the age of 92. 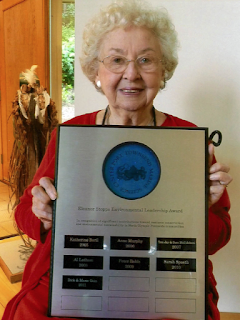 The leadership award created in her memory is presented annually to a citizen of the North Olympic Peninsula (Jefferson and Clallam counties) who has led a successful resource conservation effort that benefits the north Olympic Peninsula and its residents directly; acted as a community catalyst for programs, initiatives or ventures that demonstrate a commitment to the future of the earth and its biodiversity; become a model for future leaders in business and education; or has been an exemplary citizen or policy maker who has implemented decisions that, though they may entail risks, have helped our communities take the next step towards environmental sustainability. The Port Townsend Marine Science Center has sponsored this annual award since 2005.